For a list of the most current new features, see What's new in this release. With the new dynamic shared content workflow, you can update shared content resources without having to update the individual content that refers to those shared resources. 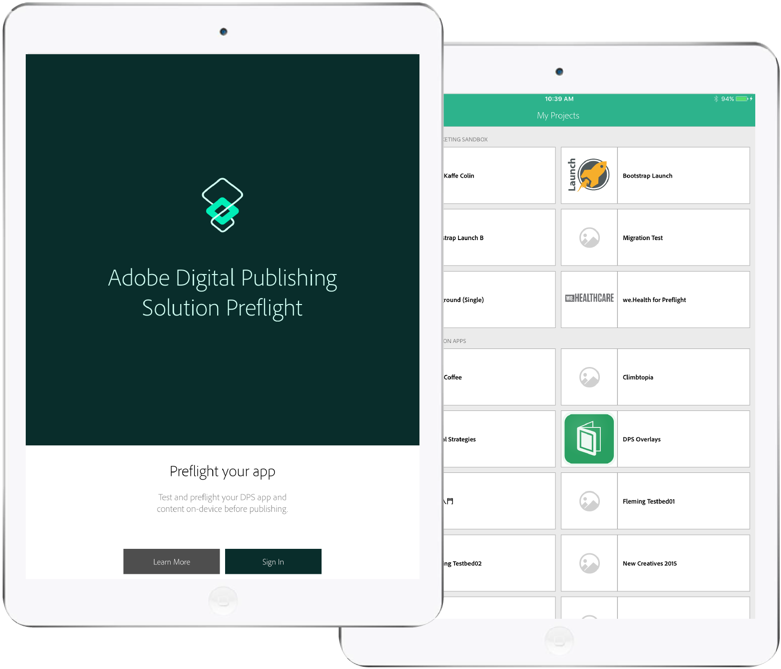 Updating shared content works for both publish and preflight workflows. Before this release, using the sharedContent entity required you to update both the shared content and the articles that linked to that content. App users were then required to tap the "Update" prompt to obtain the updates. With this release, you can use the new dynamicSharedContent entity to upload shared content. When you update the dynamic shared content and publish it, the changes are then made automatically to all referring articles. The new shared content capabilities do not affect existing shared content workflows. If you want to take advantage of dynamic shared content, you must change your existing shared content to enable the new dynamic workflow. Both sharedContent and dynamicSharedContent workflows are supported. Use the On-Demand Services API to share content across multiple HTML articles and banners. See Working with shared content using the On-Demand Services API. When you build an Android app, you can now limit the supported devices to phones or tablets. According to Android guidelines, a phone is a device with a small or normal size. A tablet is a device with a large or extra large screen size and a minimum width of 600 dp. See Building Android apps for AEM Mobile. iOS apps built in this release support iOS 9 and greater, and are not compatible with iOS 8. The minimum supported phone and tablet devices on iOS 9 are the iPhone 4s and iPad 2, respectively. The minimum system requires for iOS 8 and iOS 9 devices are identical. Existing users running iOS 8 will continue to have access to content in their installed apps. Existing or previous users will be able to install the most recent iOS 8-compatible version from the App Store if the app is not currently installed on their iOS 8 device. New users on iOS 8 devices cannot install the app on their iOS 8 device unless they upgrade to iOS 9 or later. Apple has pushed out its date for requiring apps to conform to ATS requirements. In the Apps section of the On-Demand Portal, the Allow content from HTTP option was renamed to Only allow HTTPS connections. By default, apps you build allow HTTP content. If you select Only allow HTTPS connections to comply with Apple's future ATS requirements, build a development version of your app and test it thoroughly. Make sure that hyperlinks, dynamic banners, and sign-in features work properly. In addition, to ensure that analytics data is reported properly, go to the Adobe Mobile Services Dashboard and configure your app settings to use HTTPS. For details, see Building iOS apps for AEM Mobile. This release of iOS viewers includes significant improvements to app stability for articles that use memory-intensive overlays. In addition, this release of iOS viewers includes stability and reliability improvements in downloading content. For a list of bug fixes and additional enhancements, see Bug fix release notes. App customization features for this release include the ability to turn on or off the Navigation Bar and App Menu in iOS and Android apps. You can customize the Navigation Bar to make it always visible or always hidden. With the default behavior, tapping the article briefly reveals the Navigation Bar, which hides the top of the article content. When you make the Navigation Bar always visible, the Navigation Bar no longer hides article content. HTML articles appear full-width below the Navigation Bar. Fixed-layout articles are scaled proportionally and letterboxed. In this example, the App Menu is disabled and the Navigation Bar is set to always appear. 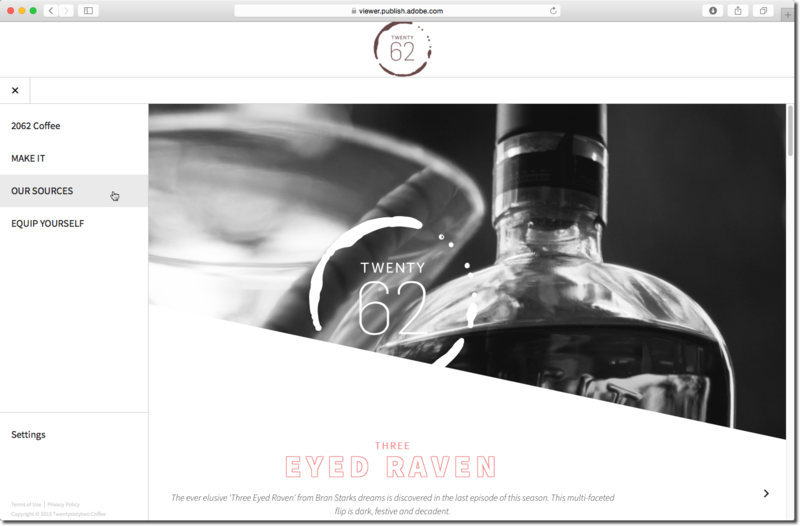 The fixed-layout article is scaled and letterboxed below the Navigation Bar. See Customizing AEM Mobile apps. See Hyperlinks in AEM Mobile apps. In addition, the cq.mobile.application.isAppSearchEnabled and cq.mobile.application.isSocialSharingEnabled APIs are now available to detect whether the app is enabled for Search or Social Sharing. See AEM Mobile specific Cordova-enabled plugins. At this time, a goto option for the Account option in the App Menu is not available. However, displaying the sign-in prompt is available through APIs. 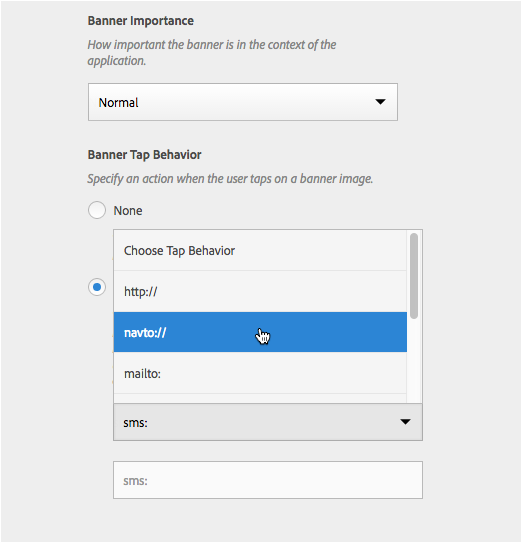 If you want to create a dynamic banner that allows the user to sign in or sign out, see the example code in Creating banners and dynamic banners: Dynamic banners. Restricted content is now hidden from search results unless the user is signed in and has access to the restricted content. Articles from a collection that is set to “Entitled” or “Free” are still displayed in search results. Free articles always appear in search results. In collections that are set to Restricted, protected or metered (non-free) articles are hidden from search results. Signing in can make restricted content available in search results. See Creating projects for AEM Mobile: Search. Dynamic banners in Desktop Web Viewer now support getEntity calls. For a list of bug fixes and additional enhancements, see Bug fix release notes. The ability to change colors and fonts in the app UI is the first of several upcoming app customization features. In the On-Demand Services Portal, you can specify different colors and fonts for various views that appear in your app, including the app navigation bar, the app menu, and sign-in and paywall screens. You can also choose to show or hide the "Account" option for signing in that appears at the bottom of the app menu. The AEM Preflight app does not display app customization settings. Build or rebuild a custom app in order to view app customization changes. Android push notifications are now available through On-Demand Services. You can send Android push notifications using the Notifications section of the On-Demand Services Portal or by using APIs. At this time, only text notifications are supported; background notifications are not yet supported. As a separate feature, you can also send push notifications using the Mobile Marketing Dashboard. To send Android text notifications, you must use the Google Play Developer Console to configure your app to work with Google Cloud Messaging. You then specify the information obtained from this process in the Portal when you configure push notifications and build the Android app. See Push notifications in AEM Mobile apps. Adobe has changed its app-signing process in order to comply with Apple guidelines and use the most current version of Xcode. The Apps section of the AEM On-Demand Portal includes a new update for the AEM Mobile Signing Tool. Once you update the AEM Mobile Signing Tool, you select the certificate from your computer’s keychain instead of specifying the .p12 certificate and password. See Signing iOS and Android apps for AEM Mobile. Starting January 1, 2017, Apple will require all apps to connect securely to servers. (Note: Apple has delayed this requirement.) AEM Mobile apps that connect to content through hyperlinks, entitlement calls, or other URL links can use only HTTPS domains to be compliant. 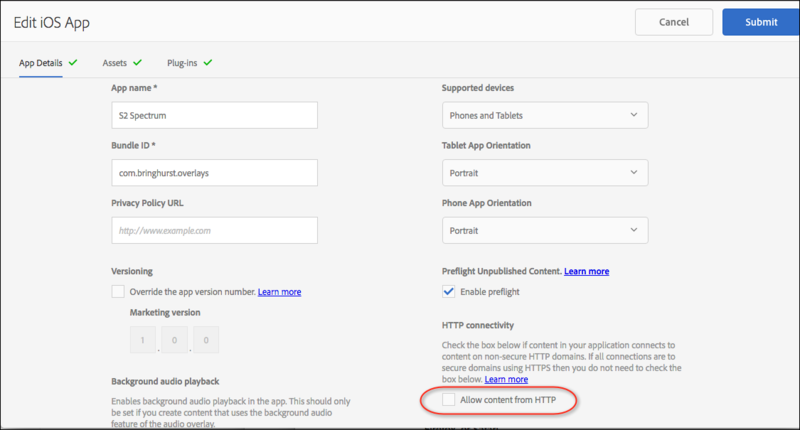 If you need to use HTTP instead of HTTPS domains, make sure that you do not select the “Only allow HTTPS connections” option (previously called "Allow content from HTTP") when building your iOS app. If this option is selected, HTTP content will fail to load in your app. When Apple requires secure connections, you might need to justify your use of HTTP domains to Apple during the submission process. See Building iOS apps for AEM Mobile. Custom authentication now supports Gigya Customer Identity Management as an identity provider, which allows customers to sign in using both traditional and various social media methods such as Facebook, Google, and LinkedIn. 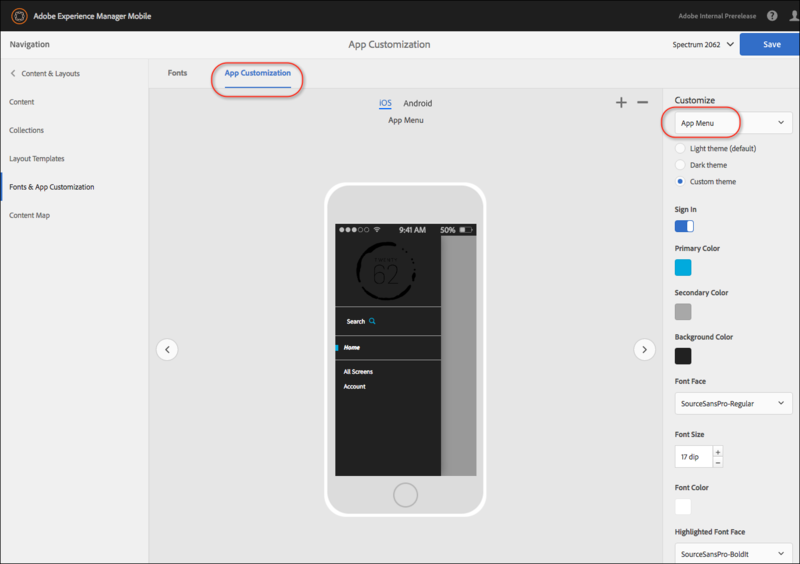 See Custom authentication in AEM Mobile apps. The On-Demand Services Portal was updated based on user feedback. For example, the “Replace Content” button is now available again, and the Content Map UI has improved. Enhancements also include more color, icon, and message consistency. Changes also include bug fixes such as cleaning up flickering when changing services. See Using the On-Demand Services Portal. All app platforms now include an auto-generated "Acknowledgements" page. If you open the app settings and choose Acknowledgements, a list of licenses is displayed. For a list of bug fixes and additional enhancements, see Bug fix release notes. With dynamic banners, you can display HTML content on cards within browse pages. Dynamic banners can display stock quotes, slideshow carousels, social media feeds, and more. By leveraging Cordova plugins, you can take advantage of AEM Mobile specific features such as allowing users to tap a slide in a slideshow banner to navigate to an article or to display the entitlement sign-in prompt..
See Creating banners and dynamic banners. This browse page includes dynamic banners for stock tickers, panoramas, entitlement sign-in, and a social media feed. The Adobe On-Demand Services Portal has been updated to be consistent with other Adobe services sites. The same features and services are still available in the revised interface. For example, the left navigation rail can be collapsed and expanded, a toolbar appears when items are selected, and the list of breadcrumb links is replaced by a single link to AEM Mobile services. Note that with this update, the On-Demand Portal no longer supports Internet Explorer and Edge browsers. Instead, use Chrome, Firefox, or Safari. Android push notifications, which were previously available only through Marketing Cloud services, are now available through On-Demand Services. At this time, sending Android push notifications is available only through APIs. The option to send Android push notifications in the On-Demand Portal should be available soon. 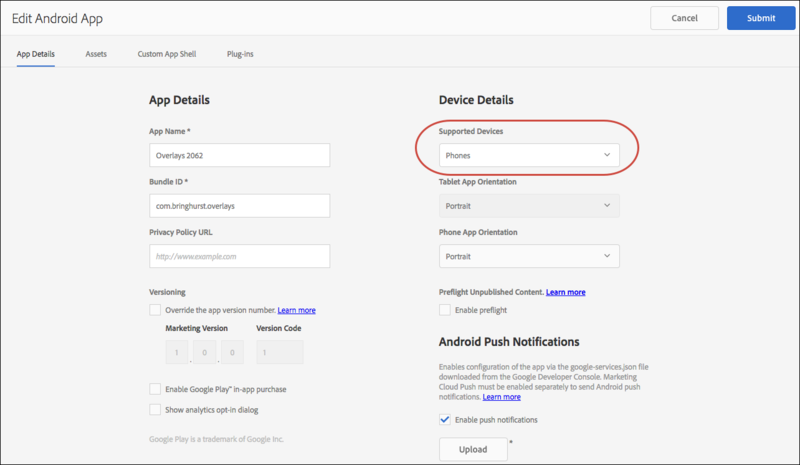 Use the Adobe Mobile Marketing Cloud (Adobe Analytics: Mobile Apps) to send push messages to both iOS and Android app users. Push messages appear outside of your app, making them useful for re-engaging passive users or conveying time-specific and location-specific information. Marketing Cloud-based push messages use Google Cloud Messaging (GCM) for Android apps and Apple Push Notification Service (APNS) for iOS apps. You can target push messages to users by specifying Analytics segments or custom segments. The ability to send push messages from the Marketing Cloud is complimentary to the Notifications feature, which lets you use the On-Demand Services Portal to send both background notifications and text notifications to iOS app users. 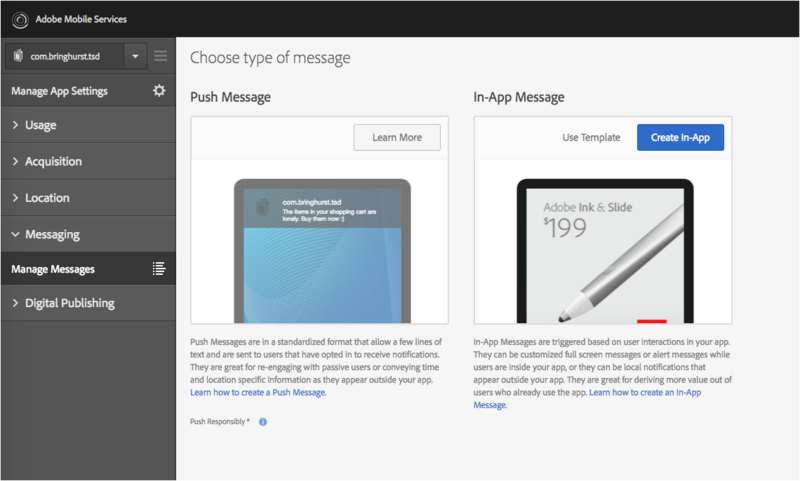 For information about sending push messages, see Sending push messages using Marketing Cloud. For an overview of Marketing Cloud integration with AEM Mobile, see Marketing Cloud integration. A Preflight option is now available when editing layout templates, allowing you to more easily preview your layout changes while editing layout templates. When you edit a layout template, you can choose between using the previously imported collection or selecting a different collection. A new layout preview option lets you show or hide the app HUD (heads-up display, or top navigation bar). Project settings now includes a Trash icon that allows you to delete the brand image. In the Fonts section of the Portal, an option is available for copying the list of fonts that are available in your project. You can paste this code snippet into your HMTL articles to reference the uploaded fonts. See Creating cards and layouts. HTML articles in iOS apps load faster, improving the user experience. Android apps built using 2016.12 support the Android 7.0 (Nougat) operating system. AEM Mobile apps will support split-screen mode, including resizing videos on the fly in split-screen mode. Desktop Web Viewer now supports the navto://relative/parent link format and improves entitlement caching performance. These features are already supported in other platforms. With the new Hide Project feature, you can avoid clutter in the On-Demand Portal by hiding unused projects. A Master Admin or a user with a "Manage Project & Users" permission can hide a project. When a project administrator marks a project as hidden, the project does not appear by default in the Portal UI for users who have access to the project. Users can toggle a button to display or hide projects marked as hidden. When displayed, hidden projects are dimmed. All features such as publishing and entitlement are still available in a hidden project. See Create projects in AEM Mobile: Hiding projects. 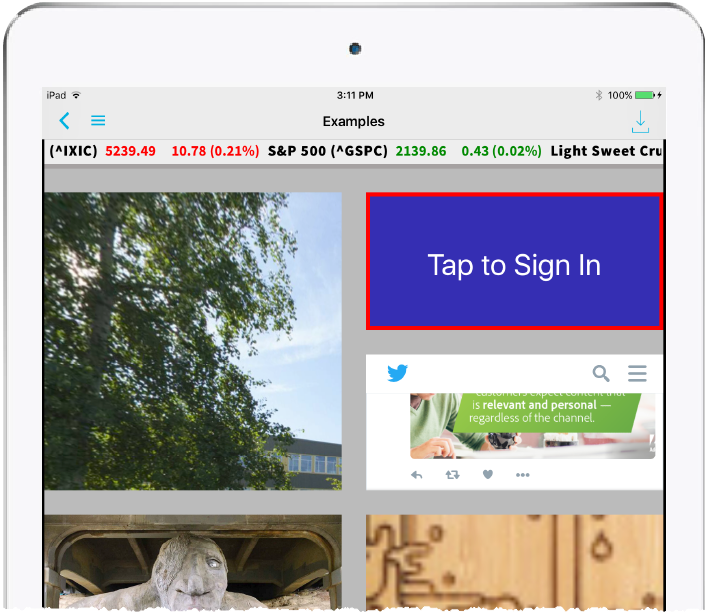 The Desktop Web Viewer now supports extensibility APIs previously available in iOS and Android viewers. These API features include the ability to obtain the page number of a specific location within an article, get entitlement information, and obtain information about contents of a collection. See Using AEM Mobile specific Cordova-enabled plugins. Android apps now support navto links with percentages for navigating within smooth scrolling articles. For example, a navto://articlename50% link would jump to the halfway point of an article. This feature is now supported in all platforms. See Hyperlinks in AEM Mobile articles. The authoring APIs now include improved support for sending push notifications as well as support for detecting hidden projects. The authoring APIs enable an automated workflow for creating and editing Experience Manager Mobile projects and content. See Integrating third-party systems with AEM Mobile. This release includes a key bug fix for Android viewers in which phone layouts were appearing on Android tablets. In addition, an updated Acrobat add-on for exporting AEM Mobile articles includes several bug fixes. 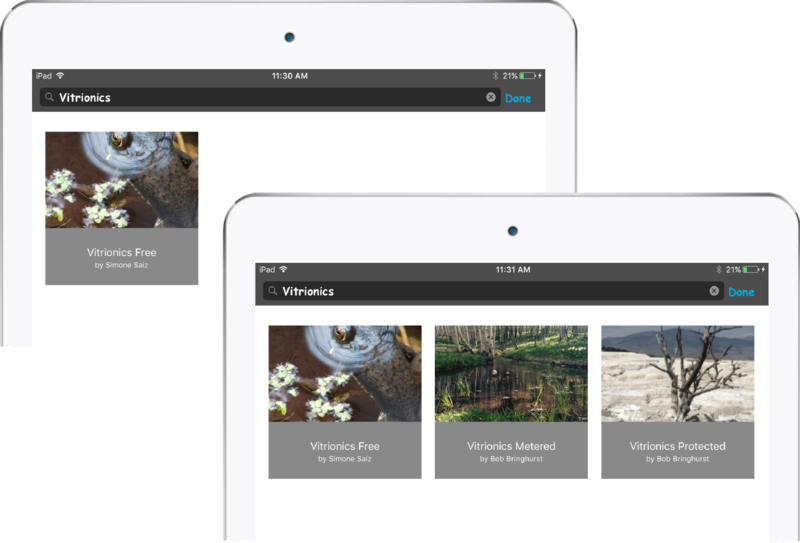 The Cordova-enabled plugins for Experience Manager Mobile have been enhanced to include the ability to obtain the article page numbe using getContentLocation. Windows Viewers now include two of the features previously available only in iOS and Android viewers. Full-width display of PDF content is now enabled as well as banners with navto:// and mailto: support. See Creating banners for browse pages and Creating articles from PDF files. 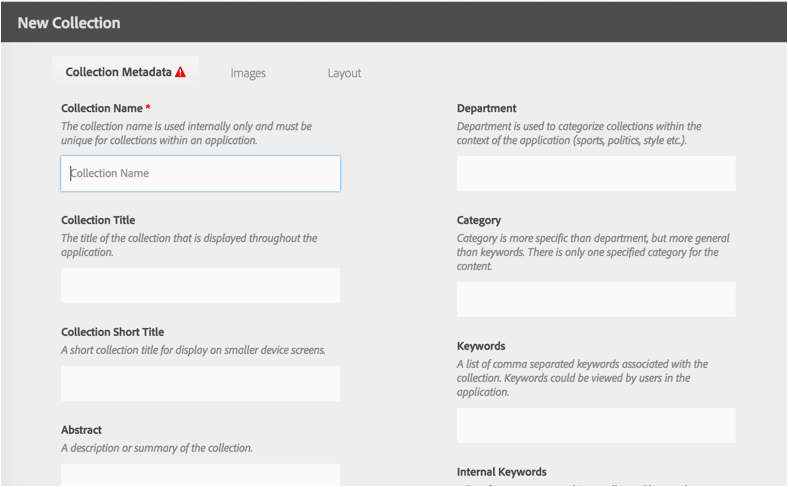 With the ability to add custom Cordova plugins to an AEM Mobile app, you can extend the capabilities of AEM Mobile apps with custom device-level functionality. You can now create content that leverages the many plugins available from the Cordova/PhoneGap community, or you can create your own custom plugins. For example, you can you can enable mobile barcode scanning, access geofences, and leverage mobile databases in your app. You can still take advantage of core Cordova plugins such as Geolocation, Camera, and Contacts that were made available in a previous release. The workflow for building the apps that use custom Cordova plugins is different from the standard method for building apps. You use the updated AEM Mobile Developer Tool to specify which Cordova plugins you intend to use. For iOS apps, you then use the Developer Tool to modify the .ipa you downloaded. For Android apps, you then use the Developer Tool to create a .apk file, which you then upload using the new Custom App Shell tab that appears when creating or editing an Android app. Custom plugins are restricted to the article level at this time. An article needs to be opened in order for the AEM Mobile app to use the plugin. 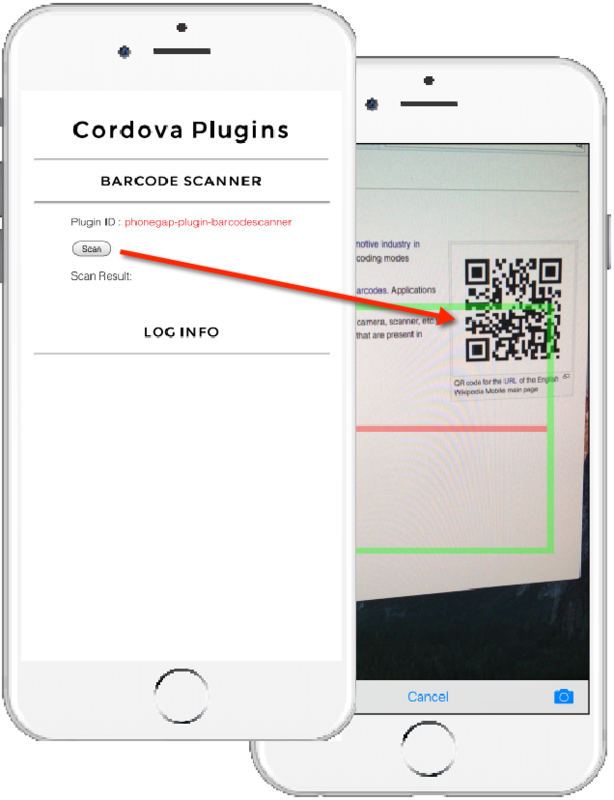 Using custom Cordova plugins to enable barcode scanning. See Use Cordova plugins in AEM Mobile apps. Providing a custom UI such as an HTML form instead of using the standard user name and password prompt. 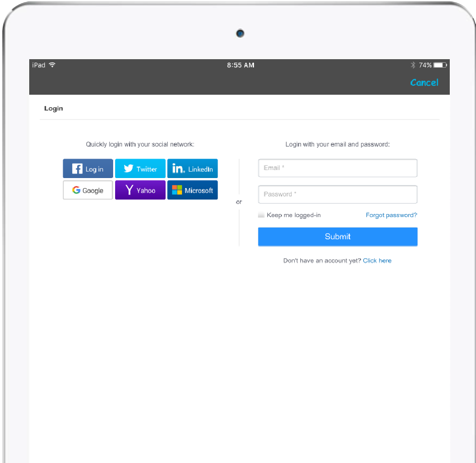 Building a sign-in experience within an article rather than through the standard authentication process. These enhancements let you expand your authentication capabilities, such as including multiple authentication methods within the same app. See Use custom authentication in AEM Mobile. Search has exited beta and is now a fully fledged feature of AEM Mobile. In-app searching has language support and is available for all platforms: iOS, Android, Windows, and Desktop Web Viewer. This release includes an update to the AEM Mobile Developer tool for both iOS and Android. With this updated developer tool, you can build and test apps that include custom Cordova plugins. See Use Cordova plugins in AEM Mobile: Using the AEM Mobile Developer Tool. Banners are now much more flexible. In addition to URL links, banners now support navto:// links to collections or articles, allowing you to link to the same article or collection from multiple cards within a browse page. You can use the mailto: format to send email, and you can use the sms: and tel: formats to send text messages or make phone calls. You can also make banners jump to the home page or be used as a back button. See Create banners for browse pages. New device-level APIs are available that make it easier for you to use an article instead of a browse page for displaying app content. The enhanced getEntity API allows you to get information for articles, collections, or banners in your app. For any collection entity, there is a new getChildren API which returns information for articles, collections, or banners within a collection. For example, you can create an article that uses the APIs to generate a tree view of the entire published entity hierarchy, with hyperlinks to articles or collections to which the user is entitled. You can check entitlement status of collections, and you can also use the getThumbnailImage and getBackgroundImage APIs to display fetched information. See Use AEM Mobile specific Cordova-enabled plugins. You can now specify which language is used to index the article metadata for in-app searching, giving you greater control over search capabilities in your apps. You can specify a default search language for articles in project settings, and you can override that setting for any article in article properties. An article will appear in search results only if its language setting matches the device language setting. 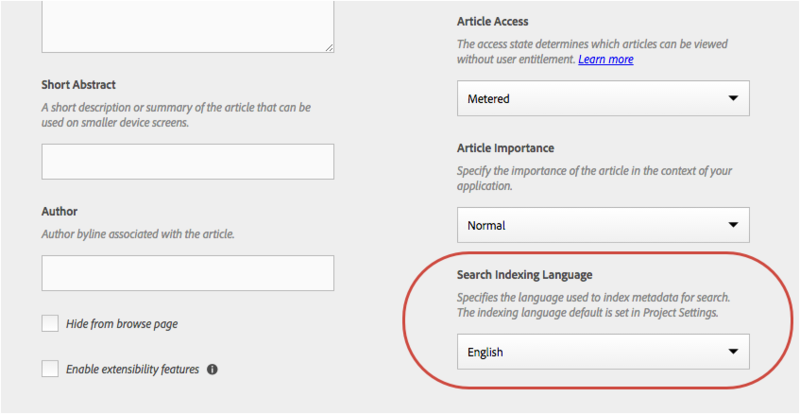 For example, articles indexed as Spanish will not appear in search results if the device language is French. Search is still considered beta at this time. When you build an iOS app, you can make it portrait-only, landscape-only, or both. If you specify the “Both” option when building your app, browse pages, HTML articles, and smooth scrolling PDF articles fill the screen in either orientation. InDesign-based or PDF-based fixed-layout articles are letterboxed to fit the screen when users rotate the device away from the article’s target orientation. The AEM Preflight app has not yet been updated to allow dual orientation display. Build a custom preflight app to test dual orientation. Inline videos stop and reset on orientation change. Image sequence auto play delay and audio auto play delay reset on rotation. AEM Mobile allows you to provide content to readers in the People's Republic of China once you have signed a “China Addendum” to your Experience Manager Mobile Service Order. When Adobe processes the China Addendum, an "Enable China Distribution" option will appear in the account project settings. The WeChat social sharing option, which is popular in China, is now supported. See Distribute content in China. A new format is available for creating links in HTML articles that leave the app and open the device browser. Use the goto://DeviceBrowser?url= format in HTML articles for links that should open an external browser or app. While there is a setting in the InDesign Overlays panel that offers control over displaying the hyperlink in the in-app browser or external browser, there previously was no option for links in HTML articles to leave the app and open the browser, unless it used a format that was already whitelisted, such as sms:, mailto:, or itms:. This goto format is not supported in banners. The Persistent Top-Level Content feature released for iOS in early June is now available in Android viewers. Any article that’s added to the top-level collection can no longer be removed from cache when the cache limit is reached. That way, users will always be able to view any article in the top-level collection even if they're offline. If Cordova plug-ins are enabled in an Android app, any required “Accept” prompts are displayed only when browsing to an article that uses that plug-in, not on initial launch of the app. 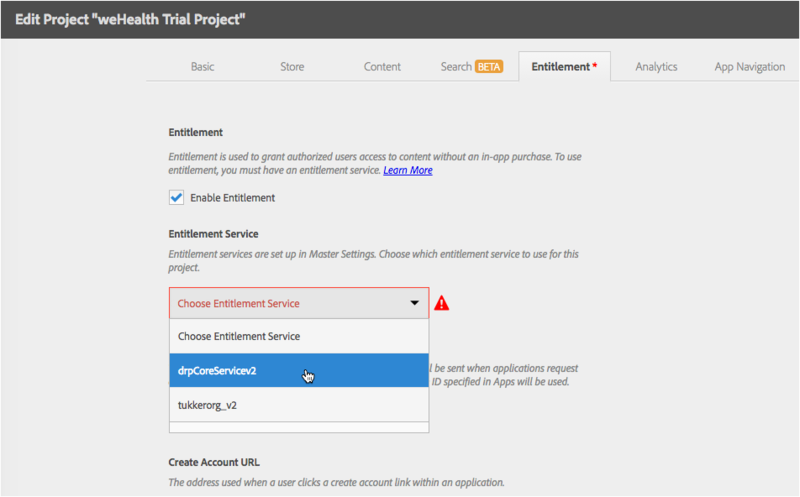 By setting up entitlement in your app, you can allow users to sign in to become entitled to additional content. Adobe has provided example code for a basic entitlement services. Instructions for editing this sample code and uploading it to your server are found at Set up an entitlement service. 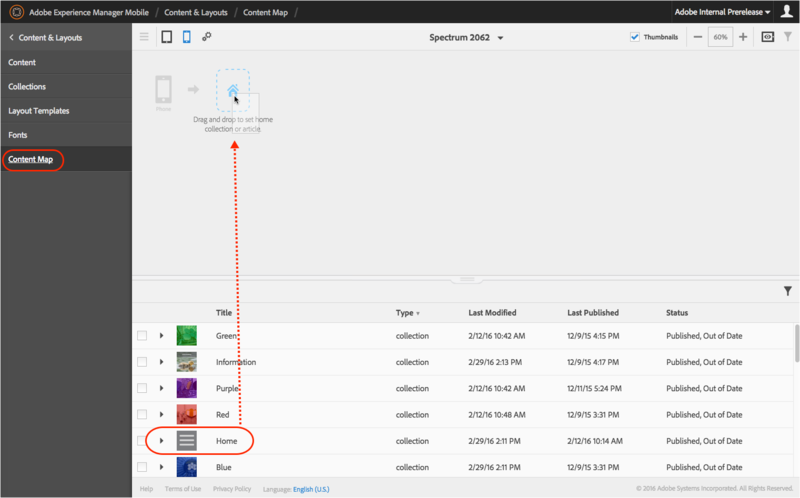 You can create AEM Mobile articles from PDF files by uploading the PDF files directly when editing articles, or by using the Acrobat add-on to export PDF files to the project you specify. With either method, you can specify whether the PDF is paginated or smooth scrolling, and you can enable horizontal swiping of paginated PDF-based articles. Links to pages within the article and external hyperlinks are supported. Other interactive elements such as videos are not supported. In the On-Demand Portal, you can upload .pdf files instead of .article files. 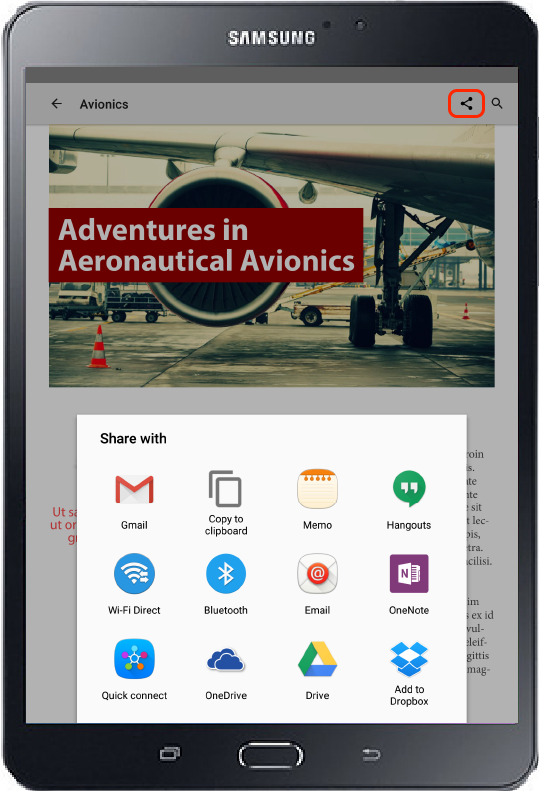 The AEM Mobile PDF Export for Acrobat add-on makes it easy to convert PDF content for viewing in mobile apps. This add-on is now publicly available and is no longer in prerelease. Once you install this add-on in Acrobat, you can use Acrobat to upload PDF-based articles to the project you specify. 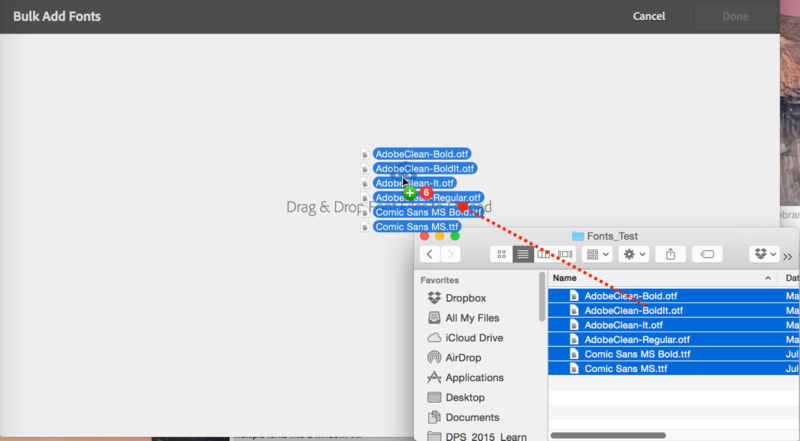 Acrobat can load PDFs from a computer’s local file system, Document Cloud, Creative Cloud, Dropbox, and Microsoft SharePoint. You can upload individual PDF files to a project, or you can do a bulk conversion. See Create articles from PDF files. With Custom Authentication, you now have greater control over the authentication process and can customize the sign-in experience in AEM Mobile apps. 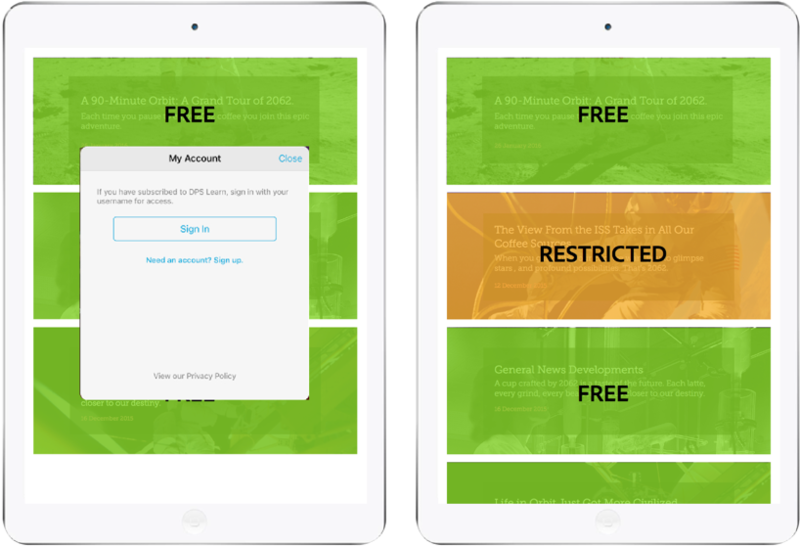 The custom authentication sign-in experience appears in the app as a full-screen web view that you design. For example, you can allow your sales representatives to login to the app using their email and password plus OKTA verification (SAML 2.0). Or, you could allow customers to log in to the app using their Gmail or Facebook account (OAuth 2.0). The app obtains authorization tokens from these identity providers, which you can use in your entitlement service to grant users access to content. Note that an entitlement service using the v2 Direct Entitlement APIs is still required to authorize users to content. Identity providers are set up in Master Settings and applied to a project in Project Settings. 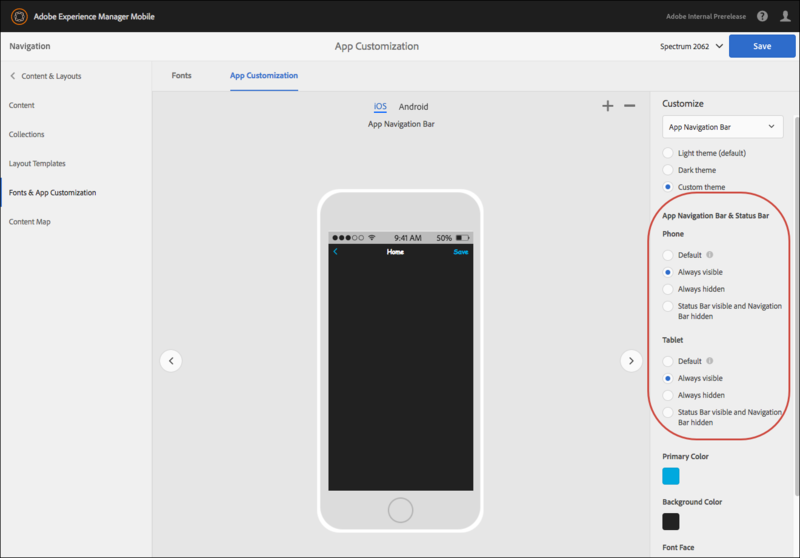 See Use custom authentication in AEM Mobile apps. 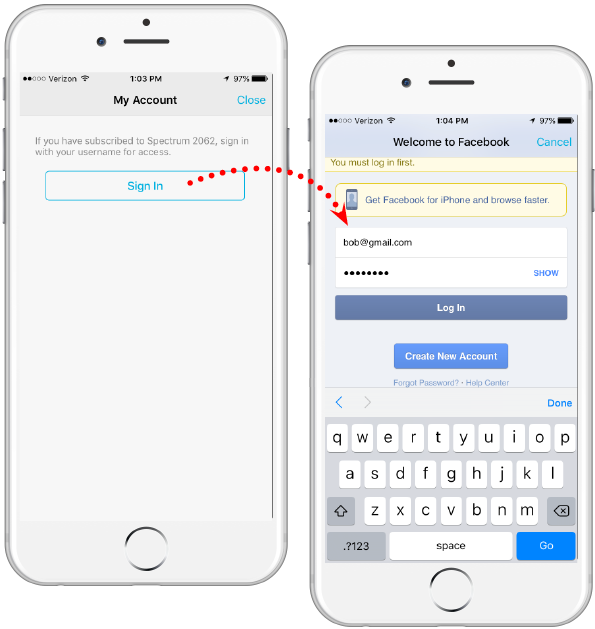 Use authentication APIs to enable entitlement sign-in from any web view in your app. With these APIs, you have greater flexibility to trigger the sign-in prompt from any web view in the app. The authentication APIs support the Custom Authentication feature, providing more flexibility when tying your custom authentication to a v2 entitlement service. See Use AEM Mobile specific Cordova-enabled APIs. With the ability to reference app fonts in HTML articles, you no longer need to upload fonts separately for each article. By referencing fonts that are uploaded in the app, you improve article download speed and performance. See Create HTML articles: Using app fonts. The Search option is now available in Desktop Web Viewer, allowing users quicker access to your content. In-app searching is now supported on all platforms: iOS, Android, Windows, and Desktop Web Viewer. Create projects – Creates an AEM Mobile project folder structure that is ready for local development. 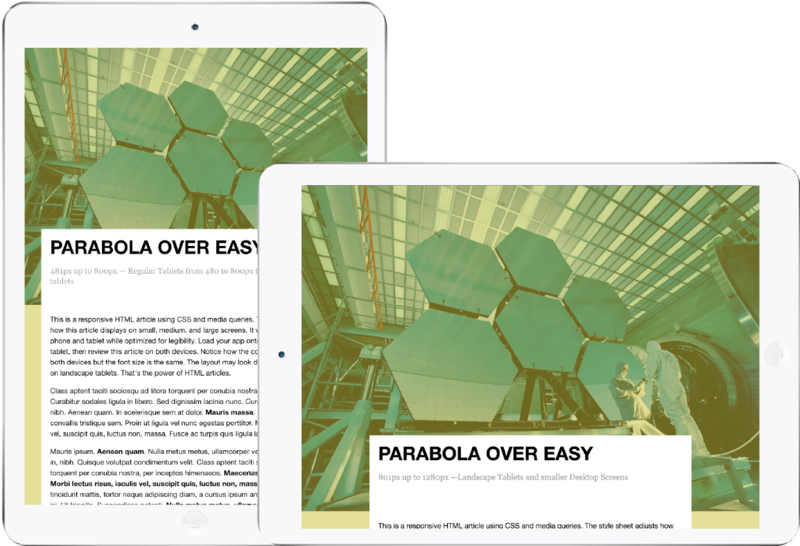 Create contents – Creates an AEM Mobile content template that is capable of using the available Cordova and Runtime APIs. Run on simulator – Launch, install, and start the simulator build that will display local content from the local environment. Help – Displays help for the command line commands. For details, see Use Cordova plug-ins in AEM Mobile. The first phase of adding extensibility through Apache Cordova is now available for Windows apps. Now, with the addition of Windows, you can take advantage of a set of APIs to extend the content in your apps and engage your users more deeply through device-level functionality, on all three major device platforms. When you build a Windows app, you can use the Plug-ins tab to specify which core Cordova plugins are enabled. See Use Cordova plug-ins in AEM Mobile. Any article that’s added to the top-level collection can no longer be removed from cache when the cache limit is reached. That way, users will always be able to view any article in the top-level collection even if they're offline. At this time, only iOS viewers support this feature, but it should be available soon in Android and Windows apps. The Overlays panel in InDesign CC 2015 has been redesigned. The new panel displays the overlay types in the top section of the panel and the settings for the selected overlay in the bottom section. These changes affect only the appearance of the panel; the functionality of the interactive overlays remains the same. The updated panel will be available when you update InDesign CC 2015. See Create interactive overlays in InDesign. Browse pages will load the most optimized version of an image used on the card, improving loading times of browse pages. These optimizations occur in the background. The On-Demand Services APIs now allow you to fetch additional information such as article size and publishing job status. See Integrating third-party systems with AEM Mobile. 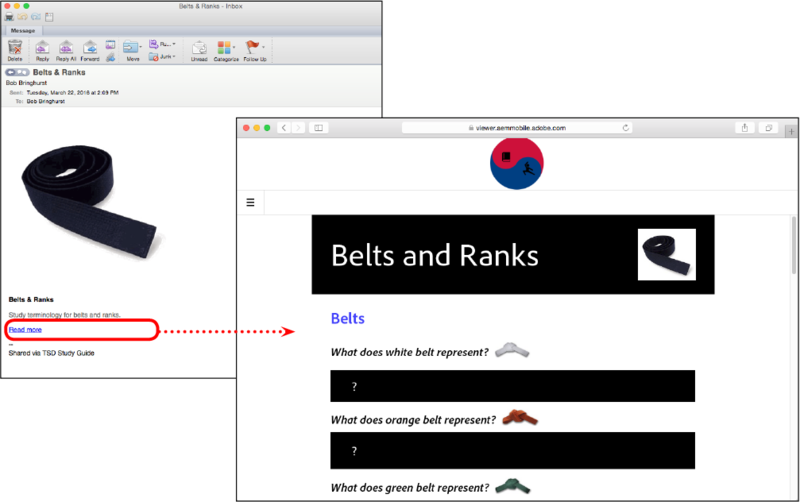 The Desktop Web Viewer includes improvements in navigation and UI based on user feedback. For example, the logo banner is now smaller and remains in place when content is scrolled. In addition, the hover effect of the next/previous buttons at the bottom of web viewer now occurs only when the actual arrow button is moused over. When you enable Social Sharing in a project, your customers can share now content with other customers from either iOS or Android apps. When a customer shares an article from an app, a link to the article appears on the social share landing page, or the link can send users directly to the URL you specify in article settings. For details, see Enable Social Sharing. Use app-based APIs to access specific information related to the app and provide more authentication information. Desktop Web Viewer now supports content entity metadata, app data, getAuthToken, and isAuthenticated APIs. In the Content section of project settings, you can change the default so that the “Enable Extensibility Features” option is selected in all new articles. That way, if you want to allow extensibility in all of your content, you no longer need to select this option for new articles. iOS and Android apps now collect analytics for in-app searches, enabling visibility into search queries and patterns. The Desktop Web Viewer now tracks subscriberId and subscriberType in analytics. When building an iOS app, you can enable the WKWebView plug-in in order to render HTML files the same way they render in Mobile Safari. This option uses WKWebView (WebKit) instead of UIWebView for HTML articles and web overlays on iOS 9 devices. An app running on iOS 8 devices will still render content using UIWebView. This option is available at the bottom of the "Plug-ins" tab when building an iOS app. To test your HTML content and determine whether you want to enable this option in your app, choose the WKWebView option from the Settings menu in the AEM Preflight app—when the update becomes available—and preview your HTML content. See Build iOS apps for AEM Mobile. When you upload an article file, the size of the article is displayed in green, yellow, or red, depending on the size of the file. For articles marked as yellow or red, you can view an estimate of how long it will take for the article to download and see which content can be improved through optimization. To view different methods for optimizing content in your app, see Optimize content used in AEM Mobile. All non-internal metadata fields are now included in search results, including Short Title and Short Abstract. Deleted content no longer appears in search results in preflight apps. The display transition of search results is smoother. iOS and Android apps collect analytics for in-app searches. Users can now share an article when viewed in search results. See Create projects: Search (Beta). This release include several bug fixes and performance enhancements, including improved performance in the On-Demand Portal when multiple publishing requests are occurring. For this release's bug fixes, see Bug fix release notes. This release consists of two types of plug-in capabilities: Core Cordova plug-ins and App Runtime APIs. Core Cordova APIs Supported plug-ins include Camera, Geolocation, Contacts, Calendar, File Storage, Media Capture, and more. Use these Cordova plug-ins to take advantage of key mobile device features such as determining the store nearest to the user’s location and allowing users to add contact information to their device's Contacts list. App Runtime APIs Use these app-based APIs to access specific information related to the app and its content from within an article. For example, you can obtain metadata information for an article or collection, determine whether the device is a phone or tablet, and check whether the user is entitled to a collection. These app APIs provide opportunities to extend integration with Adobe Marketing Cloud and business-critical third-party systems. When you build your app, you specify which Cordova plug-ins you want to enable in the app. The App Runtime APIs are available in any app built with AEM Mobile 2016.4 or later; you do not need to enable them when you build the app. For any article that uses Core Cordova APIs or App Runtime APIs, you must select “Enable Extensibility Features” in article properties. For details, see Use Cordova APIs and Use App Runtime APIs. When viewing a list of articles or collections in the On-Demand Portal, you can now filter content by searching for partial words. For example, if you filter Article Title content based on “product,” you could display only article titles named “Key Products,” “Product Details," and “Value Productions.” Keywords must include at least the first four characters of any word in the title (or department) to result in a match. For details, see Manage articles: Sorting and filtering articles. When you upload an article or display the Content File tab in article properties, you can see the size of the article file. Entitlement services for your apps are now set up and configured in master settings and project settings. In master settings, a master admin creates entitlement services to be used in projects. In each project, the appropriate entitlement service can be selected for each project. This setting replaces the previous "Integrator ID" setting. If entitlement was already enabled in a project before this release, the entitlement service is automatically configured based on previous settings and is available in the drop-down menu. For details, see Set up entitlement. In-app searching is now supported in iOS, Android, and Windows apps, allowing users quicker access to the content in your app. See Create projects: Search. Analytics now supports tracking Subscriber Type and Subscriber ID for iOS and Android devices. See Analytics Report Guide. Desktop Web Viewer is no longer considered Beta. See Set up the Desktop Web Viewer. Deep linking capabilities previously available only in iOS apps are now available in Android apps. For example, you can create a link from outside the app that jumps to a specific article. See Hyperlinks: Linking from outside the app. If both Social Sharing and Web Viewer are enabled, links to shared articles can open the Desktop Web Viewer on desktop and laptop browsers. See Use social sharing. Clicking a share link opens the article in Desktop Web Viewer. 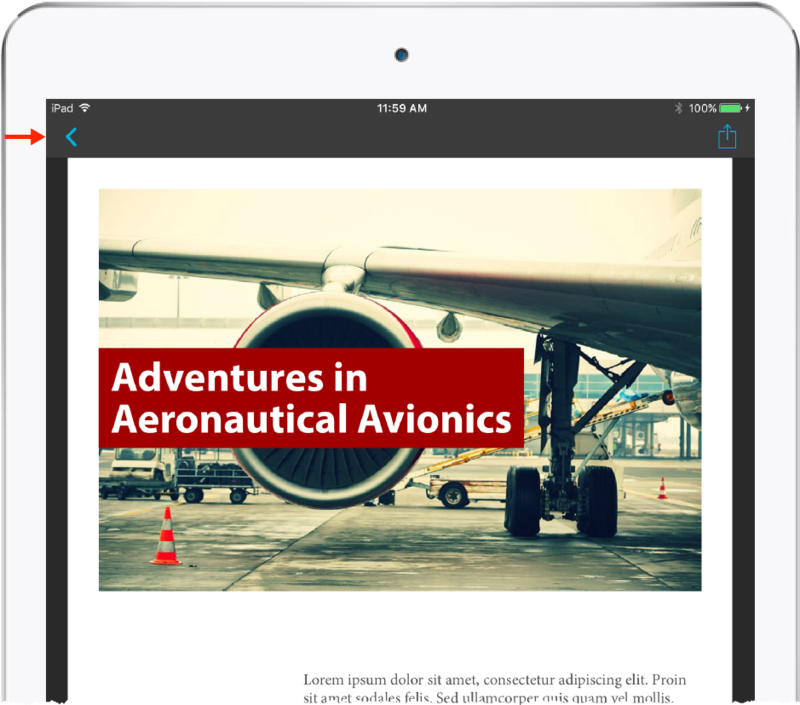 With the AEM Mobile PDF Export for Acrobat, an Acrobat DC add-on, you can instantly convert any PDF into an article. You can join the prerelease program for this plug-in by signing in to the prerelease site. 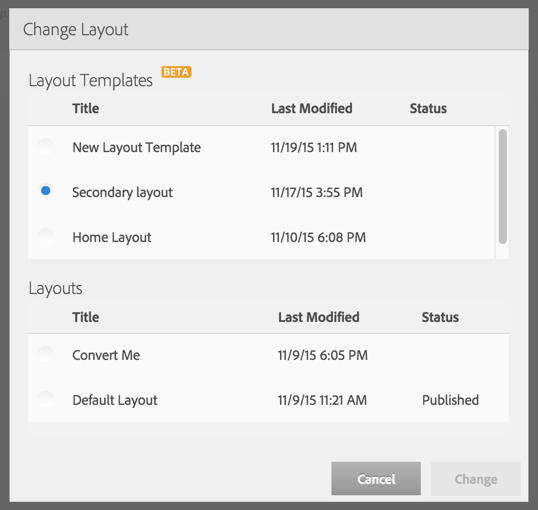 With this release, the Layout Templates section of the Portal is now officially available. 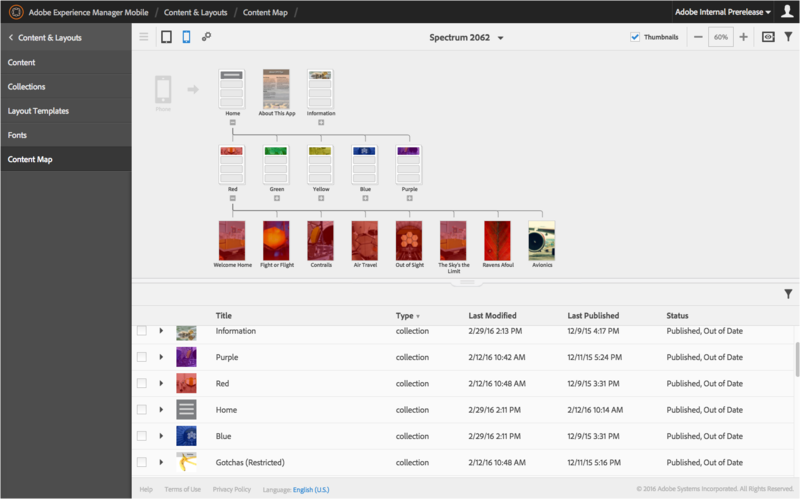 The new Layout Templates tool provides an easier-to-use, WYSIWYG editor for editing cards and layouts, and the original Cards and Layouts sections in the Portal have been removed. 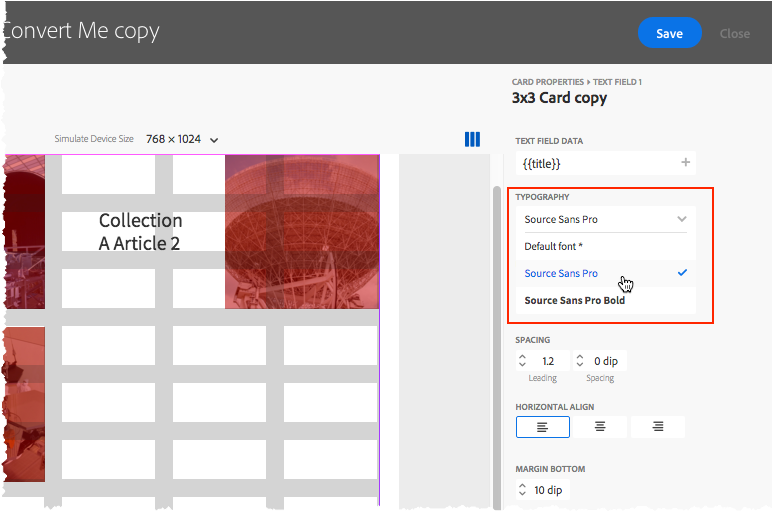 In your projects, layouts and cards created using the previous method have been converted to layout templates automatically, with all settings and publishing states maintained. No change is required on your part. To edit layouts and cards, use the Layout Templates section of the Portal. Use Layout Templates to define cards and layouts. With the intuitive Content Map interface, you can drag and drop articles and collections to add, delete, and reorder content. Manage top-level swiping and provide a clear visual representation of your app structure for phone, tablet, and web viewer. Drag and drop content from the lower section to add it to the structure. All items in the top row are “top-level” and shown in the app menu. The first item in the top row is what users see when they first launch the app. You can add, move, and reorder items. Move or reorder an item by dragging it in the upper section. Drag an item between items to add or move. Drag the item onto a collection to add it to the collection. Click the + icon below a collection to expand it; Shift-click the + icon to expand the collection without collapsing others. To remove an item, hover over the item and click the X in its upper right corner. For details, see Manage collections: Using Content Map. Android apps now support In-App Messaging through Marketing Cloud. In-App Messaging combines custom messaging with triggers to deliver specific messages when the specified conditions are met for iOS and Android apps. To use In-App Messaging with AEM Mobile, a license for Adobe Mobile Analytics is required. See Analytics: In-App Messaging. The Desktop Web Viewer now supports Pan & Zoom overlays. All InDesign-based overlays are now supported in web viewer. See Set up the Desktop Web Viewer. In-App Search (Beta) is now supported in Windows apps, as well as iOS (Search should be available in Android apps in the next release). See Create projects: Search. 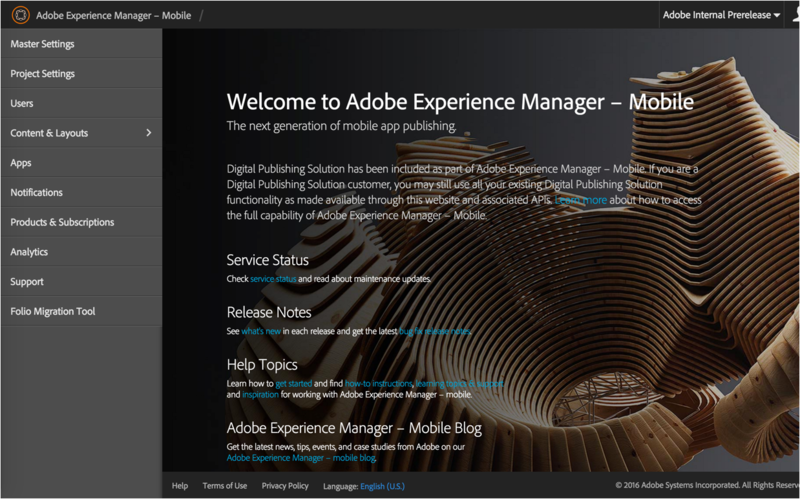 On February 22, 2016, we announced a new product called Adobe Experience Manager Mobile. 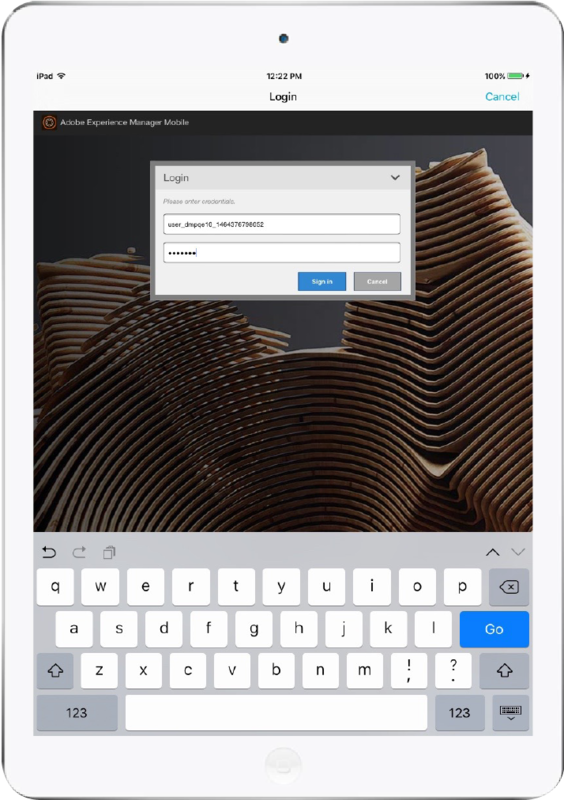 As part of the Adobe Marketing Cloud, this new product combines the functionality of Adobe Digital Publishing Solution (DPS) and Adobe Experience Manager Apps—plus delivers brand new capabilities—into one comprehensive mobile offering for the enterprise. Learn more about what Experience Manager Mobile has to offer in this blog post. Improve content discovery by enabling in-app searching in your app. Enable in-app searching in project settings to index article metadata. If you enable in-app searching in your app, a Search option appears in the app menu. Your users can then perform searches based on metadata, such as finding articles by a specific author or finding all articles with a company name. If the search string matches any article metadata, the article appears in the list of results. In this example, a search for "Simon" resulted in four articles by an author named Simon. 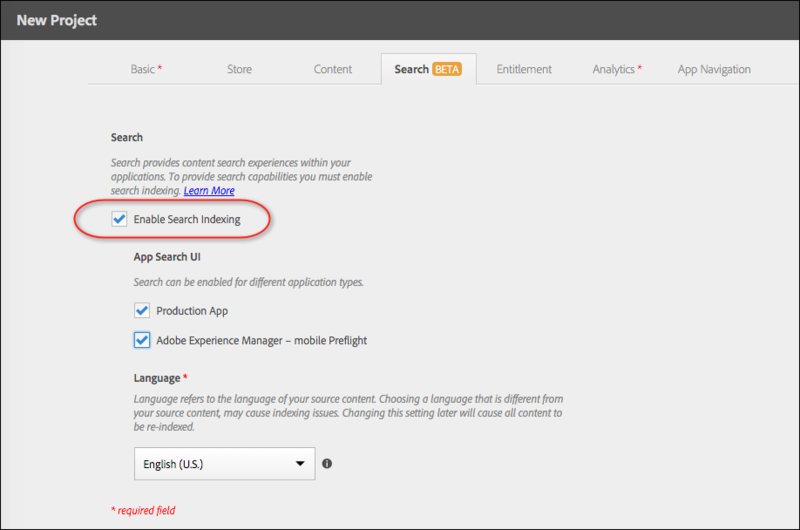 Once you enable search indexing, you cannot disable it. Content metadata in that project will always be indexed when you create articles. However, you can turn off search capabilities in your product app or your preflight app. At this time, search is English only. Search works in iOS and Android apps, but not yet Windows apps. Search is not limited by restricted content at this time. Search results might contain restricted articles even if the user is not entitled to them. Search does not distinguish phone- or tablet-only content at this time. Search results might include iPad content even though the request came from an iPhone. At this time, the display of cards in search results is not editable. In-app search does not yet support search of HTML article content. The AEM Mobile Preflight app for iOS does not yet have search enabled. However, an updated version has been submitted to Apple. When approved, the AEM Mobile Preflight app will include search capabilities. For details, see Create projects: Search. We’ve introduced two new card mapping rules that enable more design automation. First, you can use "Rule Active" option to apply a card only to the specified number of items that match the criteria. For example, you can create a mapping rule that applies a wide card to only the first item in the collection. Second, you can use the "Map Elements" option to apply a card for every nth card that matches the criteria. For example, if you want to create alternating cards, you don’t have to specify different metadata and make sure the articles are in exactly the right order. Instead, simply create a card that applies the rule to every second card. For details, see Cards and layouts: Mapping cards. Instead of adding fonts one at a time, you can now drag and drop multiple fonts into a window. With the upcoming release in March, the Layout Templates section of the Portal will no longer be considered Beta. The original Cards and Layouts sections in the Portal will be removed. Layouts and cards created using the old method will be converted to layout templates automatically, with no change required on your part. If you want to edit your layouts and cards after the next release, use the Layout Templates section of the Portal. Custom Domain URL. You can specify a Custom Domain URL to host Desktop Web Viewer content on your own website instead of using the default Adobe server location. Additional overlay support. Audio and image sequence overlays are now supported in Desktop Web Viewer. Analytics opt-in. The "Show analytics opt-in dialog" option is now available when you set up Desktop Web Viewer. If enabled, users see an opt-in dialog box before viewing content. The Desktop Web Viewer is still in beta release. For details, see Set up the Desktop Web Viewer. iOS and Android apps include improved performance and behavior when loading browse pages and articles. In Android apps, the paywalls for protected and metered articles refer to signing in rather than purchasing if in-app purchasing is not available in the app. This change was made for iOS apps in the previous release. Layout renditions offer design flexibility, allowing you to define different appearances for the same collection on tablets, phones, and the Desktop Web Viewer. With this new feature, it's now possible to provide the same content for all supported platforms and devices while maintaining design control. When you create a layout template, you can define different layout and card settings for tablets, phones, and the web. The rendition settings for each target device then determines appearance of the browse page, depending on the device. Layout renditions are especially useful for projects with 1 top-level collection, but they can also be effective for projects with 2 top-level collections in which you use any of the same collections for both phones and tablets. In the following example, the cards in this layout template have different appearances on tablets and phones. The tablet rendition has a 3-column layout while the phone rendition has a 1-column layout. For details, see Create cards and layouts: Layout renditions. Collection navto support. Links that jump from articles to collections are now supported in Desktop Web Viewer. Layout renditions. If you want the browse pages in the Web Viewer to have a different appearance than in tablets, you can create a layout rendition specifically for the web. iOS apps include stability changes and fixes based on crash log analysis. In iOS viewers, the paywalls for protected and metered articles refer to signing in rather than purchasing if in-app purchasing is not available in the app. Android apps now support download notifications for collection downloads. With Restricted Collections, you can create DPS apps that display only the collections to which users are entitled. Once users sign in, they can see previously hidden content. This capability allows you to define a content experience that is unique and meaningful to different types of users. 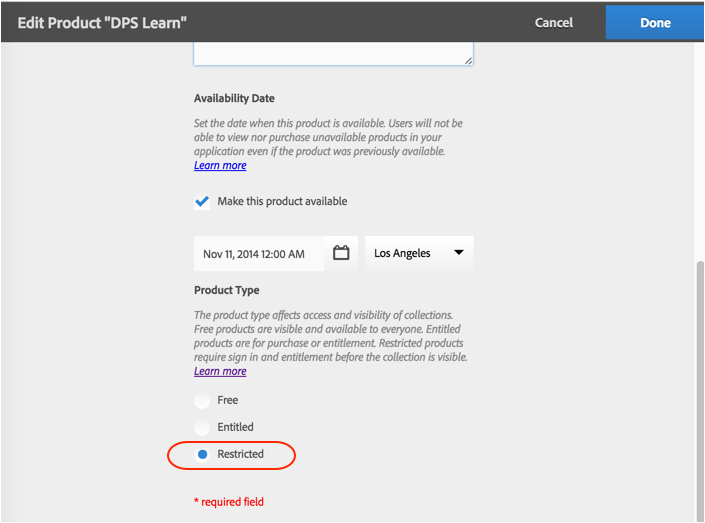 For example, a DPS app distributed to your sales organization could show different product content and pitch presentations depending on a user’s sales region or business unit. To enable restricted collections, set up direct entitlement in your project, and change the Product Type to "Restricted" for products associated with collection that you want to hide. Change the product type to Restricted. Restricted collections are hidden until the user signs in. For details, see the Set up restricted collections help article or the Use Restricted Collections video. In addition to targeting iOS, Android, and Windows platforms, you can now display DPS 2015 app content in a Desktop Web Viewer. The web viewer allows everyone in your enterprise to access DPS content, even users without mobile devices. The web viewer runs your full DPS app in a desktop web browser, including browse page navigation, fixed-layout or HTML-based articles, and entitlement options. The web viewer team is still addressing bugs with interactive fixed-layout content, so the web viewer is currently identified as public beta. Use the Apps section of the Portal to specify Desktop Web Viewer options. Then click the URL link to view your published content in the web viewer. You can then make the web viewer available to your customers using any method, such as through email or a link on your web page. Use the Apps section to build Web Viewer, and then click the URL link. For details about web viewer, see Set up Desktop Web Viewer. Adobe DPS Converter for Acrobat is an add-on to Adobe Acrobat DC that is now available on both Mac OS and Windows computers. Use the Converter plug-in to easily generate DPS articles from PDF documents created using any source product, including Microsoft Office, Photoshop, Illustrator, and AutoCAD. The Adobe DPS Converter for Acrobat will allow you to easily repurpose all of your corporate documents in DPS, even preserving hyperlinks. Now business users who don’t know InDesign or HTML can create content for DPS with just a few clicks. An added advantage of editing capabilities of Acrobat opens up new possibilities for editing workflow solutions when you don't have the original documents. For information about joining the prerelease, see Available in Prerelease: Adobe DPS Converter for Acrobat. In order to optimize performance, a new limit of 450 items (articles, banners, and collections) per collection is now in place. 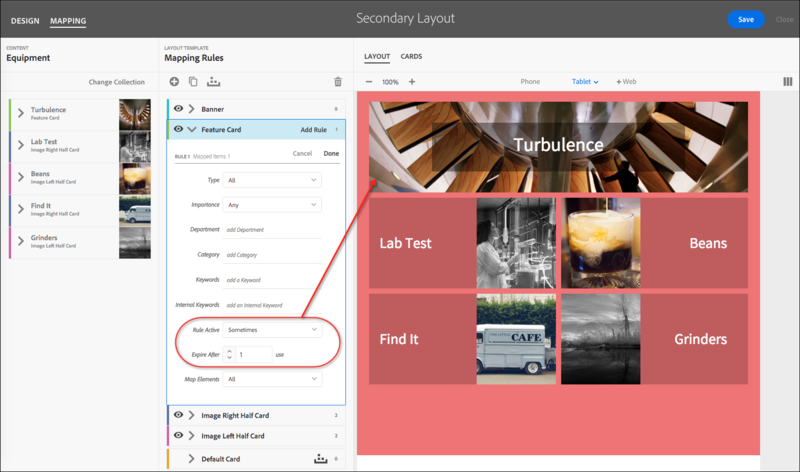 A new interface for designing cards and layouts is now available. 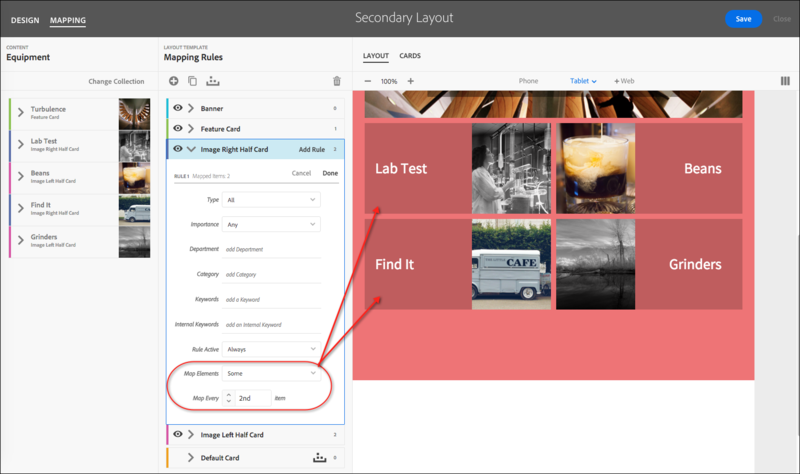 For the time being, you can use either the new Layout Templates method or the existing Cards tab/Layouts tab method for designing your browse pages. In the near future, only the Layout Templates method will be available. 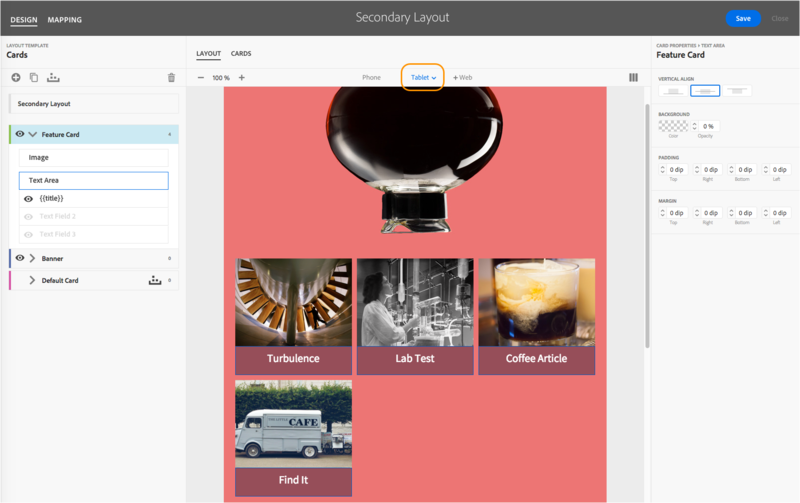 With the Browse Page Authoring Tool, you can use the same interface to create layouts, design cards, and map cards to content. During the creation process, you can specify an existing collection to view while you adjust browse page settings. You can change the target device size, turn on and off a grid, and click a card area to edit settings for that text or image area. You can even reorder items in the collection you've imported. You can view your actual content while defining card and layout properties. 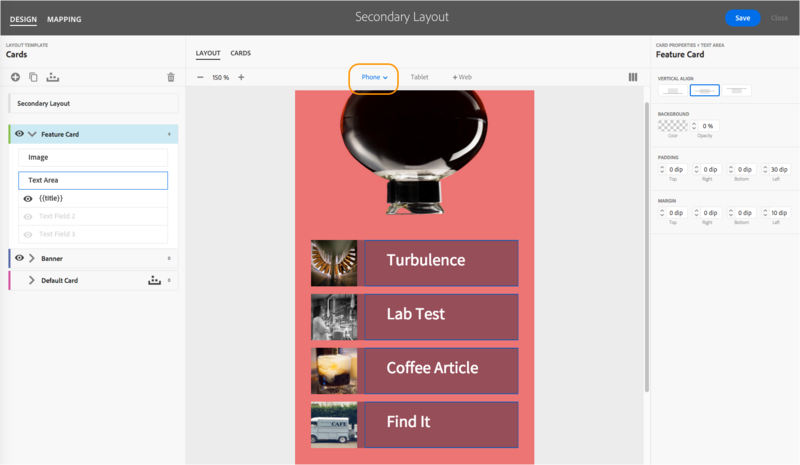 You can import layouts you've already created so that can be edited using the Browse Page Authoring Tool. When editing the collection, you can specify either type of layout. 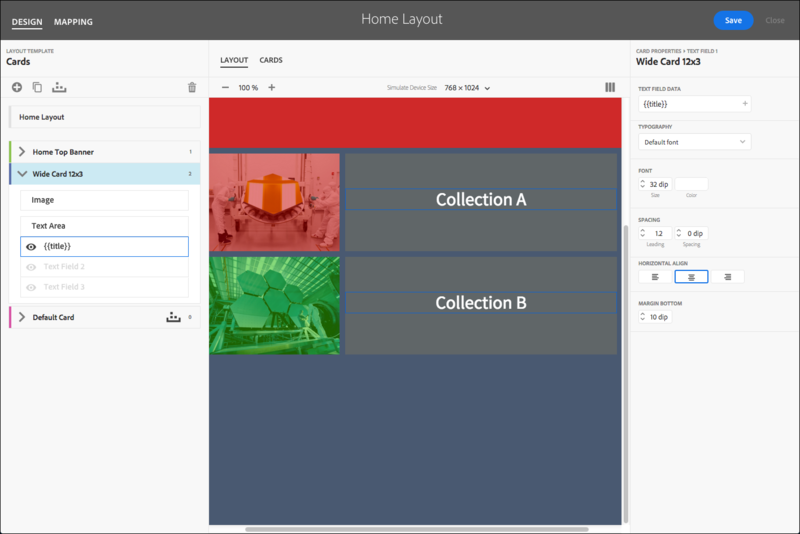 When you assign a layout to a collection, you can specify a layout or layout template. For details, see Creating cards and layouts. 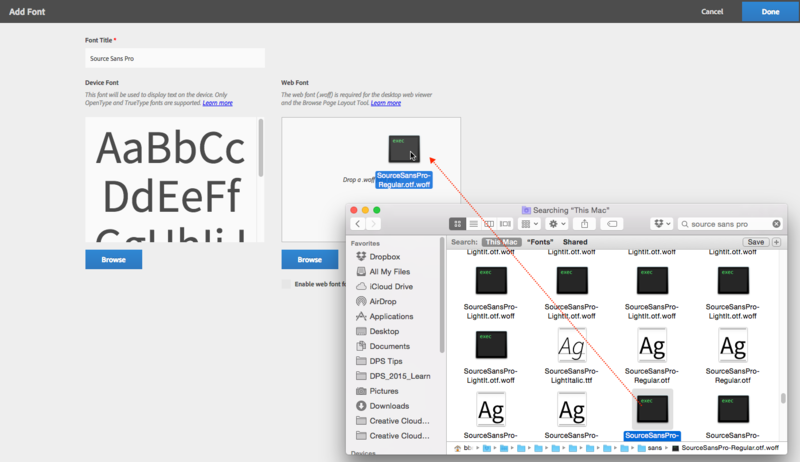 Uploading fonts for use in cards is now much easier. The Content & Layouts Dashboard now includes a Fonts section. Simply drag the font files into the Add Fonts section, and then choose those fonts from a drop-down list when editing your cards. First, upload the fonts . . .
. . . and then choose them from a drop-down list when creating cards. For each font you use, we recommend that you add both the Device Font (OpenType or TrueType) and the Web Font (WOFF). Device Fonts are used in phone and tablet browse pages. Web Fonts are used in the Desktop Web Viewer (currently in limited beta), in Windows apps (if the .otf or .ttf cannot be embedded), and for previewing fonts in cards when using the new Browse Page Layout Tool. Note that whenever you add a new font, you must rebuild your app to make the new font available at this time. Use navto://collection/[collectionname] to jump from an article to a collection. Linking to collections was previously supported only in iOS and Windows apps. Use navto://relative/parent to jump to the parent view of the current article. In most instances, the navto://relative/parent button functions the same ways as the Back button. If the parent button appears in a target article that is in the same collection as the source article, tapping the parent button would jump up to the collection browse page, whereas tapping the Back button would return to the source article. The goto://FolioNavigation/lastview format has the same behavior as the Back button in the navigation toolbar. These formats were previously supported only in iOS apps. Use navto://collection/[collectionname]/article/[articlename] to jump to an article within the context of a different collection. Doing so allows users to swipe horizontally to view other articles within that collection. In this example, the link jumps to an article in a different collection and allows users to swipe to view different articles within the coffee equipment collection. This format is supported in all platforms. Instead of navigating to a different view and returning to check for content updates, you can now swipe down on a browse page to refresh it. The update prompt appears if an update is available. 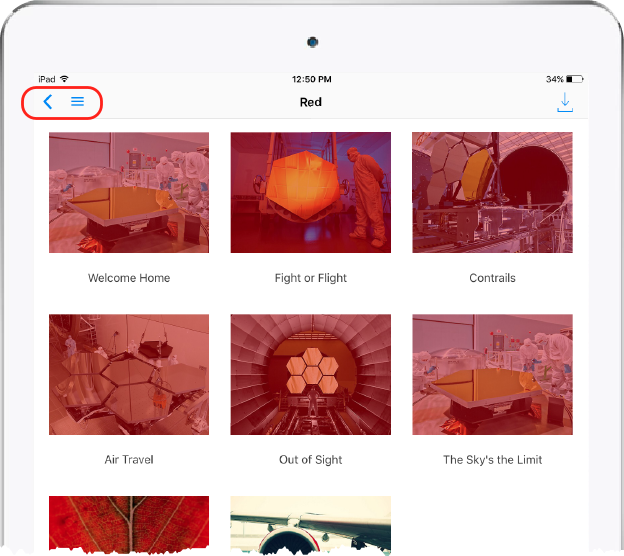 When you build an app, you can now drag-and-drop multiple image files into the Assets section. The correct image sizes are selected automatically for each option. To build assets for icons and splash screens, use the DPS asset generator: Build app icons and launch images. iOS 8.1 is now the minimum OS required for iOS apps instead of iOS 8.0. In the Portal, you can now select multiple items and edit their metadata. For example, you can select multiple articles and specify a keyword that applies to all the selected articles, or you can select multiple collections and apply the same Product ID. Use navto://relative/parent to jump to the parent view of the current article. In most instances, the navto://relative/parent button functions the same ways as the Back button. If the parent button appears in a target article that is in the same collection as the source article, tapping the parent button would jump up to the collection, whereas tapping the Back button would return to the source article. Users can now access the App Menu from any browse page or article navigation bar on an iPad or iPhone. The left side of the navigation bar includes a Back button and an App Menu button. iOS app users can now delete all user data—both cached and downloaded content—from their devices. The Clear Content option is available in iOS Settings. The DPS Preflight app is now available in all supported stores: iTunes App Store, Google Play Store, and Windows Store. The Android version of the DPS Preflight app now supports landscape view. In My Projects view, rotate the device to the desired orientation before launching the project. When you tap the project to view it, the app is set to the current orientation. The iOS version of the DPS Preflight app will also include this behavior when the updated version becomes available. For the Windows version of the DPS Preflight app, you can rotate the device to view content in different orientations as long as device orientation is unlocked in Settings > Screen. For details, see Use the DPS Preflight app. The DPS 2015.5 (Oct. 3) release included support for explicit downloads of collections on iOS devices. With the DPS 2015.6 (Oct. 27) release, users can tap an icon to explicitly download the collection in all three platforms—iOS, Android, and Windows. A downloaded collection will not be removed from the device until the user manually removes it. Whenever users view browse pages and articles in an app, the content is loaded into cache. When the cache limit (300 MB) is reached, the least recently viewed content is removed from cache. Downloading a collection prevents the its contents from being purged from cache. A downloaded collection is not included in the cache. The "Allow user to save collection to their device" option (new) must be selected in collection properties. The user must have access to the collection. The collection must be downloaded from a browse page. If a collection is set to Content View instead of Browse Page, it cannot be downloaded at this time. After downloading a collection, the user can then tap the icon to make the collection contents removable again as new content is added to cache. If the WiFi connection is lost during a download, the download resumes automatically when the WiFi connection is restored. If the collection is updated, new and changed content is automatically included in the download when the user accepts the update prompt. DPS integrates with Adobe Document Cloud for seamless conversion of PDF documents into DPS articles. 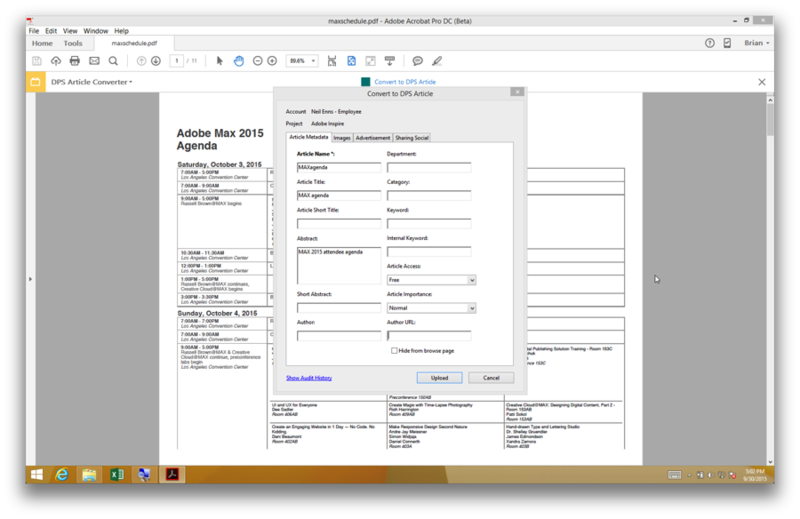 With the Digital Publishing Solution Converter for Acrobat, an Acrobat DC Desktop add-on, you can instantly convert any PDF into a DPS article. For details, see Available in Prerelease: Adobe DPS Converter for Acrobat. This release includes a number of bug fixes. For details, see Bug fix release notes. The DPS Preflight app is available in iTunes App Store, Google Play Store, and Windows Store. 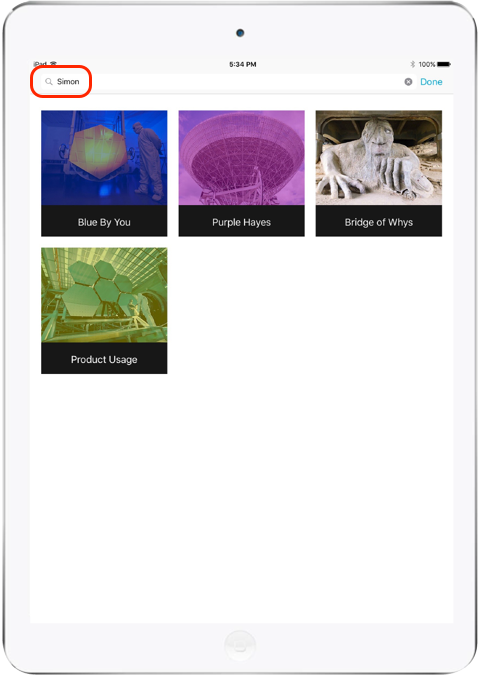 With the DPS Preflight app, you can sign in and view all the projects you which you have access. Once you select a project, you can then preview the app. To switch to a different project, tap the "My Projects" option at bottom of the app menu. The DPS Preflight app is useful for previewing content and browse pages. The DPS Preflight app does not support custom fonts for the app menu or entitlement options such as purchases and paywalls. The current default orientation is portrait. 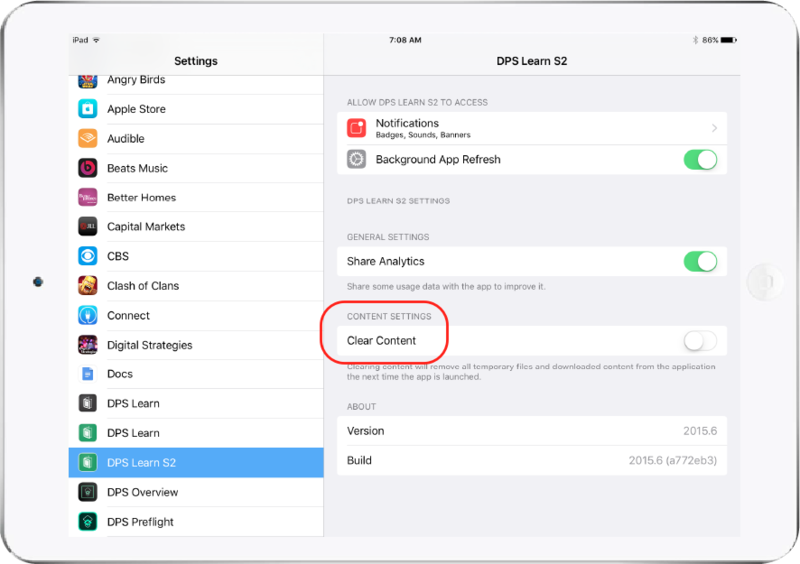 To change the orientation for iPads, go into device Settings, scroll down and select DPS Preflight, and select Landscape. In the UI, “Preflight” has replaced “Preview.” Instead of selecting “Enable Preview,” you now select “Enable Preflight.” Instead of clicking the Preview icon, you now click the Preflight icon. The primary difference between using the DPS Preflight app and a custom preflight app is that a custom preflight app includes the app icon, launch images, and (optionally) custom fonts. Building a custom preflight app is also useful to preview landscape content on an iPhone, Android, or Windows device. When you create an article, banner, or collection, you no longer need to specify the name in a separate dialog box. Instead, you specify the name in the metadata page, where the name you specify is checked for validity and uniqueness. This release includes a number of bug fixes. For details, see Bug fix release notes for DPS 2015. This release includes a number of bug fixes and performance improvements to apps, including improved rendering of cards and layouts when opening browse pages. In addition, iOS apps now load approximately 50% faster than in the previous release. For details, see Bug fix release notes for DPS 2015. When building iOS apps, you can specify whether the app works only on phones, only on tablets, or works on both phones and tablets. 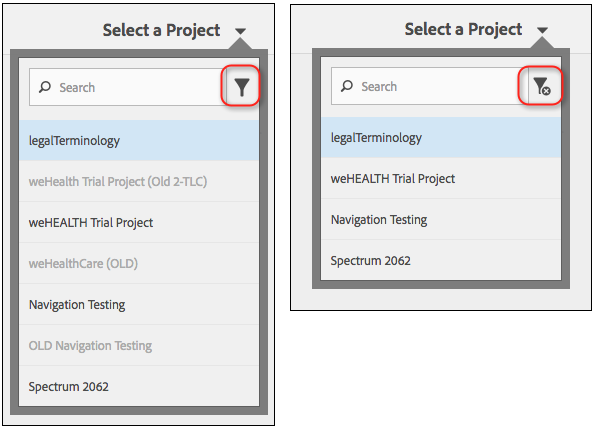 Wherever you can click in the Portal to display the list of projects in the account, a search field now appears, allowing you to quickly filter and select the project you want to work on. Migrated DPS articles that refer to HTMLResources now work properly on Android devices. The Digital Publishing Solution 2015.3 release on August 25 includes bug fixes and performance enhancements. For details about bug fixes, see Bug fix release notes.